Baptist Homes is an active and welcoming environment. This is in large part due to our friendly and engaging activity staff who work closely with residents to plan individual and group activities. Our certified staff understand the importance of social interaction and self-expression as well as the therapeutic needs of our residents. 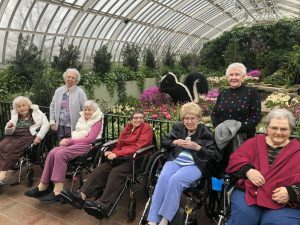 Daily, evening and weekend programs include pet and music therapy, Wii bowling, Internet access, bingo, bridge, cooking activities, crafts, exercise groups, book reviews, musical performances, travelogues and outings to cultural, sporting and other events. The culture of person-centered wellness is deeply rooted in all we do. There are active Resident Councils across our continuum who assist with the planning and selection of activities as well as address campus-wide concerns. All Resident Councils hold regularly scheduled meetings and enhance the sense of community for residents.